A sailor's view of Brooklyn and New York City. The sport of kiteboarding is more closely associated with Hawaii, Australia and New Zealand, but we're glad to report that the sport is alive and well in the Borough of Kings, specifically at Plumb Beach. Over the weekend, there were a few kiteboarders, and many more windsurfers taking advantage of the 10-to-12 knot winds off Plumb Beach. When the wind is between 15 and 25 knots, more kiteboarders emerge from the shores of Plumb Beach. The kiteboarders we spoke with said they lived in Manhattan and head to Plumb Beach in Brooklyn "because its close." One of the guys owned a car. They also told us they prefer to go kiteboarding if the winds are in excess of 15 knots. "Its much more fun," a kiteboarder told Sail Brooklyn. "If there is less wind, you need a bigger kite," he added. As far as how much experience one needs to start kiteboarding, one kiteboarder told us he had never windsurfed and only wakeboarded before he started kiteboarding. He added that it was a lot less hassle and less expensive than campaigning a J/120 sailboat. If you want to try it out, there are many spots in Long Island to rent gear and take lessons. 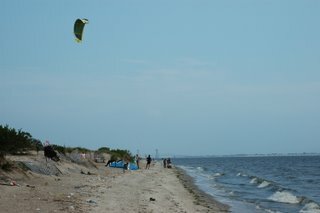 Two places on the East End are Hamptons Windsurfing: (631) 283-9463 and Main Beach: 516-647-0678. Hampton's Windsufing and Main Beach both have kite gear for sale and kite lessons available. 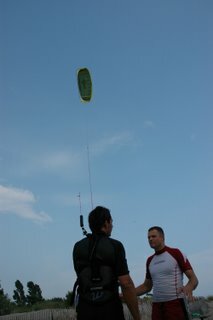 There is also a local kitesurfing instructor, Skatoor, who supplies gear with all his lessons: 203-984-1097. Give a Hoot, Don't Pollute!